This is the sixth of a series examining the moral dimensions of economic “externalities,” the spillover or incidental side effects in market activity. Harold Demsetz examined ethical questions about property rights from the perspective of human action; as he saw it, we have “no basis other than human action, or the consequence thereof, by which to judge the ethical properties of alternate economic organizations” (97.) From that statement one can already note Demsetz’s consequentialist approach, which remains consistently evident throughout the work. As Demsetz approached it, ethical judgments about economics are frequently given in terms of “some unspecified, usually vague concept of ‘justice’ or ‘morality,’ often stated quite independently of an examination of the human action implied by that economic organization;” examples given were “It is immoral to allow owners of factories to put smoke into other people’s air” and “It is immoral not to assess the person causing damages with the liability for those damages.” (97-98, emphasis original.) His strategy was to counter a specific deontological argument by Walter Block, the full analysis of which assessment is outside the scope of this post. Demsetz’s argument is right along Coasean and welfare economics lines, arguing for economic efficiency as the criterion for allocating resources in the presence of high transaction costs: “why not assign the right to that party who would find it most valuable?” since the “criterion of efficiency assumes no more than does the criterion of the marketplace” (104.) 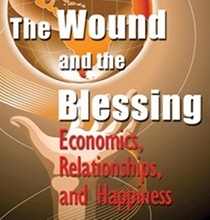 He continued that “The market weighs and compares the beneficial and harmful effects, measured in the money that people are willing to pay,” with the result that situations that would result in a net economic loss are eliminated. He further noted that “we frequently encounter notions of fairness, equity, and justice that seem derivative from efficiency considerations” (107.) Given the incommensurability of personal utilities, focusing on willingness to pay reduces personal utility to a common quantitative measure. Paul Heyne had a different conclusion. In his view “Empirical measures of economic growth are not, as is so often assumed, measures of increasing wealth;” this is because “productivity is being measured without reference to the human purposes that give to the concept of productivity whatever significance it has” (354-355.) He approached this by analyzing voluntary vs. involuntary exchanges, because it is there that on can identify just how extensively economists base their “descriptions, predictions, or explanations” on “assumptions about the rights that people ought to have” (355.) Where Demsetz wanted to determine property rights based on questions of economic efficiency, for Heyne determining property rights precedes efficiency determinations. Externalities, or unintended side effects to parties outside a contract, involve non-voluntary and uncompensated participation in a productive activity engaged by other parties. Where transaction costs are high or intractable, Demsetz would grant property rights to those who value them most as measured in monetary terms; he rejected deontological rights that trump efficiency grounded consequentialist market solutions. Heyne seems to differ in (at least) two critical areas. First, in difference with Demsetz, for whom property rights systems should be determined in terms of economic efficiency, for Heyne a property rights system is necessarily prior to determinations of economic efficiency; that is, the very notion of efficiency is meaningless outside a property rights system that defines the values from which goal oriented behavior can emerge. Perhaps over time property rights systems can infrequently adjusted (Demsetz, 106,) but in general I think Heyne’s argument reasonable that property rights are prior to determining economic efficiency. Second, Heyne argued for moral rights that legal market transactions should not override; Demsetz did not discuss such possibilities, and from the tone of his argument it is not clear that he might agree in particular circumstances. Whether or not these moral rights are deontologically or consequentially derived is open to discussion, as Heyne did not specify. Examples of externalities discussed in the literature frequently are of readily tractable instances, such as a smoke producing factory damaging someone’s prized flowerbed. Two types of externalities are typically not addressed in Coasean market negotiation discussions. One is widespread health or environmental damage due to pollution, in which it is difficult to establish property rights. The second is an asymmetry in market agents such that, though the property rights be clear, one of the negotiating parties is unable to pay the amount required to meet the Coasean settlement. I accept that the relationships are complex and reciprocal, beyond Pigou’s typical unilateral assignment of fault. Productive activities benefit society in many ways; the smoke producing factory may be a key factor in sustaining the economic life of an area, and imposing costs or restricting output may have negative economic consequences that would impact many. If someone’s health is damaged due to a factory’s smoke, how would Demsetz find that the rights assignment should go to the party that would most value – in monetary terms – the rights? What is the price of well-being? I understand that the legal system does reduce various types of health damage to monetary values, but to then extend that as an acceptable normative method of negotiating health externalities seems at least morally questionable. Since Demsetz’s argument did not engage these kinds of questions, I find his argument incomplete. Finally, I note that the tension between deontological and consequentialist views is well represented in an Econtalk podcast between Russ Roberts, the host, and his guest, Coasean economist Robert Frank. This is an excellent discussion illustrating both Coase’s argument and the ethical tensions involved.